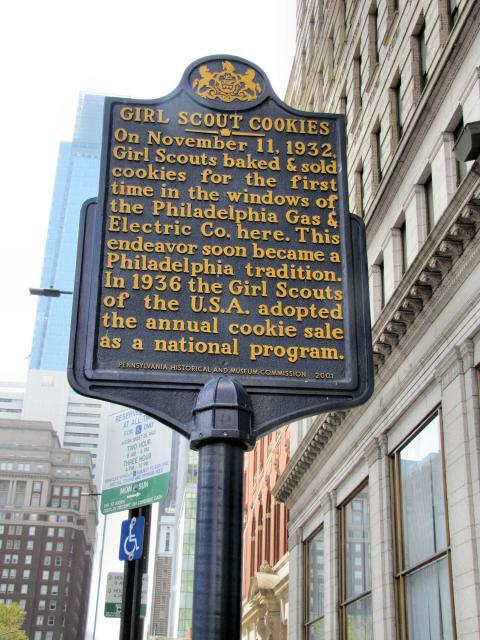 On November 11, 1932, Girl Scouts baked & sold cookies for the first time in the windows of the Philadelphia Gas & Electric Co. here. This endeavor soon became a Philadelphia tradition. In 1936 the Girl Scouts of the U.S.A adopted the annual cookie sale as a national program. This marker can also be identified by its HM code. You can use the hashtag #HM1JRO in tweets, and any other place where you might refer to this marker, including when searching on this site.